Kevin Durant and Steph Curry each drop 28 points as the Golden State Warriors beat the Memphis Grizzlies, 118-103. 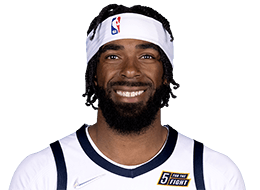 Enjoyed a career year in his seventh NBA season, averaging 17.2 points, 2.9 rebounds, 6.0 rebounds and 1.51 steals on .450 shooting in 34.2 minutes in 73 games (all starts)… For the seventh consecutive season, led Memphis in assists and assist average… Also led the Grizzlies in total steals (110) and three‐point field goal attempts (291)… Set career highs in scoring average, total points (1,256), field goals made (463), field goals attempted (1,030) and field goal percentage (.450)… Ranked 17th in the NBA in assists per game, tied for 22nd in steals per game and 38th in points per game… Recorded 100+ steals (110) for the fifth consecutive season, joining LeBron James as the only two NBA players with 100+ steals in each of the last five seasons… Scored 19 of his 22 points in the second half and overtime in Memphis’ home‐opening victory on Nov. 1 vs. Detroit… Recorded 43 assists to four turnovers in four games from Nov. 25‐Dec. 3, recording the highest assist‐to‐turnover ratio (10.8) over a four‐game stretch since Chris Paul from March 14‐18, 2012… Tallied a season‐high 14 assists on Dec. 3 vs. Phoenix… Posted back‐to‐back 30+ point games, first scoring 30 points on Jan. 7 vs. San Antonio and then netting a career‐high tying 31 points on Jan. 10 vs. Phoenix… Had only scored 30+ points once in 469 career games prior… Became the first Grizzlies player since Rudy Gay (Nov. 2‐3, 2010) with consecutive 30+ point games… Recorded 27 points and 10 assists on Jan. 29 at Sacramento, a game in which he surpassed current King Rudy Gay as the Grizzlies franchise’s career leader in games (480)… It marked his second career game with 25+ points and 10+ assists… Averaged 19.5 points and shot .439 from three‐point range in January, the highest monthly scoring average and three‐point percentage of his career… Scored 19 points in his 500th career game on March 26 at Utah… Made numerous clutch plays throughout the season, including the first two go‐ahead three‐pointers of his career with 2:00 or less remaining in the fourth quarter or overtime, first to break a tie with 1:36 remaining in a Nov. 20 win at Golden State and the second with Memphis trailing by one with 1:08 left on April 14 at Phoenix in a victory that clinched Memphis’ franchise‐record fourth consecutive postseason berth… Made a game‐winning running floater with 1.5 seconds left on March 12 at New Orleans… Sank the two go‐ahead free throws with 1.1 seconds on the clock in Memphis’ regular season finale win on April 16 vs. Dallas, which secured the seventh seed in the Western Conference Playoffs… Led the team or tied for the team lead in scoring 24 times, assists 48 times, steals 28 times, blocks three times and minutes 20 times… Scored 10+ points 65 times, 20+ points 26 times and 30+ points twice… Recorded 10+ assists five times… Posted five double‐doubles… Missed nine games due to injury… Missed two games from Dec. 17‐18 due to a left thigh contusion… Missed seven games from Feb. 1‐12 due to a sprained right ankle. 2014 Playoffs: Ranks third in the NBA in assists per game (7.7)… Scored 10+ points five times and 20+ points once, including a playoff season‐high 20 points in Game 3 of the opening round on April 24 vs. Oklahoma City… Recorded 10+ assists twice, a playoff season‐high 12 assists in Game 2 of the opening round on April 21 at Oklahoma City… Posted two double‐doubles (seven career)… Became the first player since Rod Strickland (April 28‐30, 1995) to record at least 16 points, five rebounds and 11 assists in consecutive road playoff games in a single postseason, doing so in the first two games of the opening round series with the Oklahoma City Thunder. 2012-13 (Memphis): A breakout performer in his sixth season in Memphis, averaged a career-high 14.6 points in 80 games (all starts) in 34.5 minutes… Named to the 2012-13 Second Team All-Defense, his first career honor, after leading the Association in total steals (career-high 174) and ranking third in the league in steals per game (2.18)… Led the Grizzlies in assists per game (6.1, T-19th in the NBA) for the sixth consecutive season and ranked second on the team in scoring… Also set career highs in three-pointers made (106), three-pointers attempted (294), free throws made (234), free throws attempted (282) and blocks (24)… Shattered his own single-season records for total steals (144 in 2010-11)… Ranked third in the league in steals per 48 minutes (3.03)… Surpassed Jason Williams as the Grizzlies career leader in assists on Dec. 21 vs. Dallas… Passed Rudy Gay as the franchise career leader in steals on Feb. 24 at Brooklyn… Recorded a steal in a franchise-record 64 consecutive games from Nov. 16-March 30, the longest streak by any player this season and the third-longest streak by an NBA player since the start of the 1987-88 season behind only Chris Paul (108) and Michael Jordan (77)… Became the first NBA player to record at least 170 steals and 20 blocks in a season since Dwyane Wade in 2008-09… Finished the season strong, scoring 18.4 points on .477 shooting in 35.8 minutes in his final 17 games and scoring 20-or-more points 10 times… Increased his per game averages in points (16.7), rebounds (3.4), assists (6.3), blocks (0.35) and field goal percentage (.460) in 31 games after the All-Star Break… Averaged 13.3 points, 2.4 rebounds, 5.9 assists and 0.24 blocks on .426 shooting before the Break… Led Memphis in scoring following the All-Star Break by recording the two highest-scoring months of his career (17.6 points in March, 17.0 points in April)… Paced the team in scoring in 10 of the final 17 games… Averaged 15.6 points, 6.6 assists and 2.2 turnovers on .473 shooting in wins compared to 12.6 points, 5.1 assists and 2.7 turnovers on .373 shooting in losses… Scored 20-or-more points in a career-high five consecutive games from April 1-9, the longest streak by any Grizzlies player this season… Scored a season-high 26 points on March 27 at New York, one of his 17 games leading the Grizzlies in scoring… Set career highs by making 12-of-13 from the free throw line in that game against the Knicks… Scored 24 points in a season-high 48 minutes in an overtime win on March 20 vs. Oklahoma City… Netted 23 points and scored the final five of the game in Memphis’ 50th win of the season on April 1 vs. San Antonio, tying the game with a three-pointer and sinking the game-winning layup with 0.6 seconds on the clock… Recorded a career-high 15 assists on March 12 at Portland, the most by a Grizzlies player since Chucky Atkins dished out 16 on April 18, 2007 at Minnesota… Blocked a career-high three shots on Jan. 19 at Chicago… Shot .531 from the field and .468 from three-point range in November, leading all guards in field goal percentage… Scored 10-plus points 64 times and 20-plus points 17 times… Registered 10-plus assists nine times… Recorded seven double-doubles… Remained one of the most durable players in the NBA, playing in at least 93 percent of the team’s games for the fifth consecutive season… Missed two games due to illness or injury… Did not dress on Nov. 26 vs. Cleveland due to flu-like symptoms and Jan. 28 at Philadelphia due to a left ankle sprain… 2013 Playoffs: Posted playoff career highs in scoring (17.0, 19th in the NBA), rebounds (4.7), assists (7.1, 5th) and steals (1.73) in 38.3 minutes in 15 games, guiding the Grizzlies to their first-ever trip to the Western Conference Finals… Averaged 17.5 points, 4.3 rebounds and 5.8 assists on .383 shooting in 38.0 minutes in the Western Conference Finals against San Antonio… Averaged 18.0 points, 6.4 rebounds, 6.8 assists and 2.20 steals on .365 shooting in 41.2 minutes in the Western Conference Semifinals against Oklahoma City… Averaged 17.3 points, 3.4 rebounds and 8.3 assists on .408 shooting in 36.2 minutes in the first round against the Los Angeles Clippers… Scored a playoff career-high 28 points in Game 2 of the first round on April 22 at LA Clippers… Set a franchise postseason record with 13 assists in Game 4 of the opening round on April 27 vs. LA Clippers… Nearly recorded the first triple-double in Grizzlies playoff history with 26 points, a postseason career-high 10 rebounds and nine assists in Game 2 of the Western Conference Semifinals on May 7 at Oklahoma City… Became the fourth different player in the past 25 postseasons to record at least 26 points, 10 rebounds and nine assists in a road playoff win, joining Michael Jordan (three times), LeBron James (three times) and Baron Davis (twice)… Led Memphis outright in points, rebounds and assists in Game 2 against Oklahoma City, becoming the first Grizzlies player ever to do so in a playoff victory. 2007-08 (Memphis): Averaged 9.4 points and led all rookies with 4.2 assists in 53 games (46 starts)… Played in the T-Mobile Rookie Challenge on Feb. 15, 2008 in New Orleans, recording a team-high eight assists. After guiding Ohio State to the 2007 NCAA Championship Game as a freshman, the early-entry candidate was drafted by the Memphis Grizzlies in the first round (fourth overall) of the 2007 NBA Draft on June 28, 2007… Signed a multi-year contract with the Memphis Grizzlies on July 30, 2007… Signed a multi-year contract extension with the Memphis Grizzlies on Nov. 1, 2010. In his lone season at the Ohio State University (2006-07), guided the Buckeyes to a 35-4 record and the NCAA National Championship Game… Led the team in assists (6.1) and steals (2.2) while placing third in scoring (11.7 points) and shooting .518 from the field in 31.6 minutes in 39 games… Named to the All-Big Ten First Team by the media and All-Big Ten Second Team by the coaches… Earned 2007 Big Ten All-Tournament honors… Averaged 16.0 points, 5.0 rebounds and 4.8 assists in six games during the NCAA Tournament… Totaled 20 points, six assists and four steals in the national championship against Florida on April 2, 2007… Notched a double-double with 17 points and 10 assists on Jan. 17, 2007 vs. Northwestern. Born Oct. 11, 1987 in Fayetteville, Ark. and raised in Indianapolis… Full name is Michael Alex Conley, Jr… Son of Rene and Mike Conley, Sr., who won the gold medal in the triple jump in the 1992 Olympics and took silver in 1984… Has three siblings, Joan, Sydney and Jon… Father earned nine NCAA individual titles at Arkansas (class of 1985) and was inducted into the USA Track and Field Hall of Fame in 2004… Was a high school and college teammate of the No. 1 overall pick in the 2007 NBA Draft, Greg Oden, first at Lawrence North High School in Indianapolis and then one season at Ohio State… Paired with Oden, lost just 11 total games during his high school and college careers… Father coached both Conley and Oden during the summers, starting when the duo was in the sixth grade… Both Conley, Sr. and Conley, Jr. own high school basketball state championships… Featured on the regional cover of Sports Illustrated during the Grizzlies’ 2013 Playoff run, becoming the first Grizzlies player ever to appear on an SI cover… Gifted $500,000 to the Ohio State men’s and women’s basketball programs… In recognition of the donation, the weight room at the programs’ practice facility was named the “Mike Conley Jr. strength and Conditioning Room.”… Very active in the Memphis community, is one of two players in history (Pau Gasol) to join the Grizzlies Foundation Board of Directors… Co-hosted the 2012 Staxtacular event, his third consecutive year hosting the fundraiser benefiting the Stax Music Academy… An active participant in the Grizzlies TEAM UP Mentoring Initiative throughout his NBA career… Participated in the 2008 and 2009 “Peyback Bowl,” hosted by NFL superstar Peyton Manning, finishing second in 2008 to NFL Pro Bowl wide receiver Reggie Wayne… Enjoys bowling, golf, video games and movies… An avid bowler, who averages over 200, hosts an annual Bowl-N-Bash to benefit the Special Olympics and Memphis Police Sports Federation.